Julius van de Laar is a digital media strategist and communications expert with strong campaigning experience. He consults for politicians and political parties, non-governmental organizations and private sector corporations by providing strategic advice as they develop strategies to achieve their goals: win elections, growing and engaging their audience and shaping public opinion. During the 2012 US Presidential election, Julius van de Laar served on President Obama’s winning presidential campaign as regional GOTV director in the battleground state of Ohio. There, he focused on targeting voters and gaining supporters by combining proven campaigning strategies with the latest new media and big data tactics. In 2007 and 2008 he worked for Obama for America in nearly a dozen states and served as Missouri Youth Vote director. Since then, van de Laar has served as a senior strategist to Germany’s Social Democratic Party as well as other parties and candidates across Europe. He has consulted for non-profit organizations, start-ups and global organizations, providing strategic communications advice. 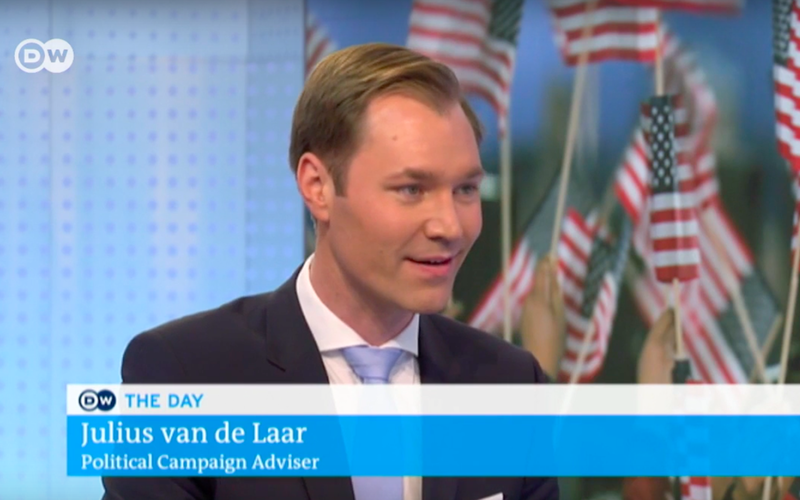 Van de Laar is a frequent TV and radio commentator, providing analysis on current political events, campaigning and digital communications. He lectures at conferences and universities, gives workshops and trainings on campaigning and social media and advises politicians and business leaders on strategic communications. “Capital” magazine recently selected Julius van de Laar as one of the “Top 40 up-and-coming talents” in German politics.